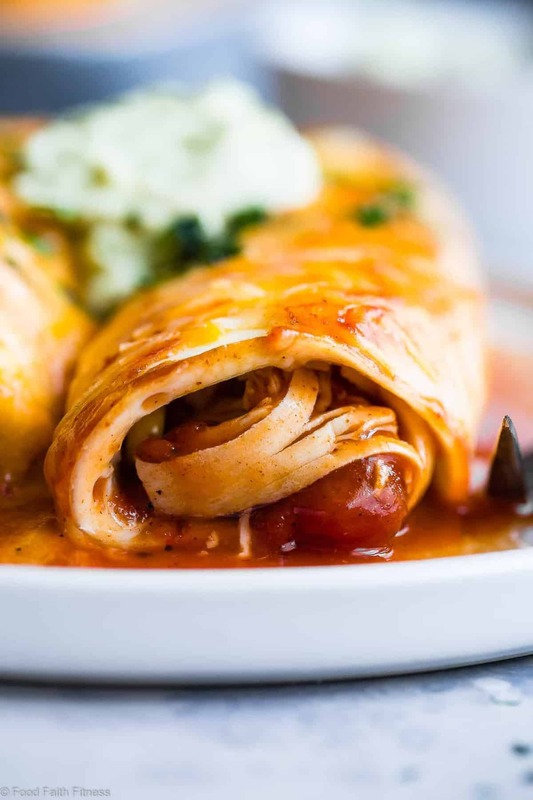 This gluten free Healthy Low Carb Chicken Enchilada Recipe uses a secret ingredient to make it low carb and protein PACKED. These do NOT taste healthy! When you are SUPER pumped to go out somewhere new to eat….and then you are TOTALLY let down. This happened to me the other day, and I’m still depressed about it. We’ve talked about how I am a little bit obsessed with gluten free Pancakes, specifically the Blueberry Harvest Grain and Nut from IHOP. I’ve told you before that you MUST eat them. But, I am telling you again. At first, I resisted. I don’t like change. How-ev-er, we had JUST gone to IHOP 2 days before, so I figured it would be the best time to try somewhere new, since I had just gotten my IHOP fix. I should not order healthy breakfast items because, let’s be honest, brownie pancakes with cookie dough swirl with ALL THE BUTTER AND SYRUP would have been way better than egg whites and mushroom on a tortilla. 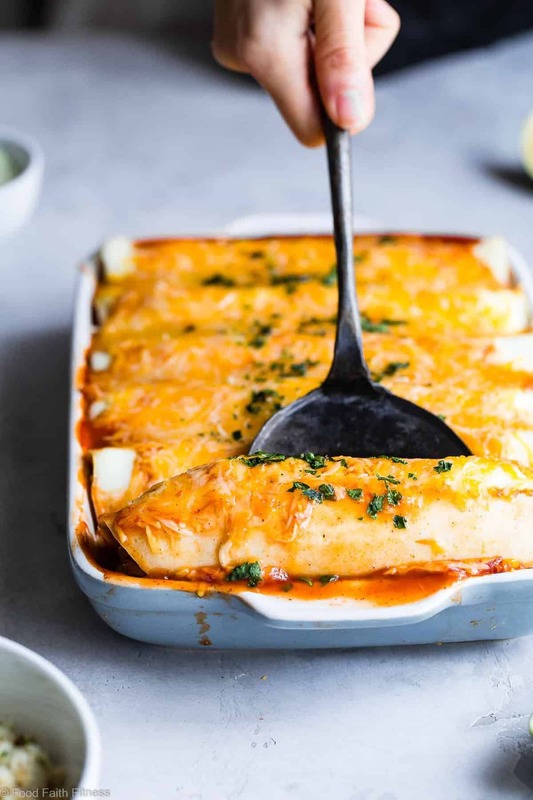 It’s to make this healthy chicken Enchilada recipe. Yes, enchiladas just got breakfasted up. Yes, this healthy low carb chicken enchilada recipe is awesome. But if you wanna eat them, liiiiike, everday? (Me! Me!) Then you’re going to be ALL OVER THESE. The secret to making chicken enchiladas healthy is to make EGG WHITE TORTILLAS. Heat a GOOD QUALITY 9 inch, non stick frying pan to LOW heat and add ½ cup of LIQUID egg whites (it will take you WAY too long to separate eggs!). 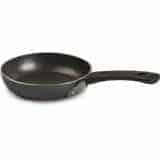 MAKE SURE IT IS A GOOD QUALITY NON STICK OR THESE WON’T WORK! Once they’re cooled, fill them with ALL the usual enchilada fixings, cover them with cheese and bake until the cheese is melted! VOILA! 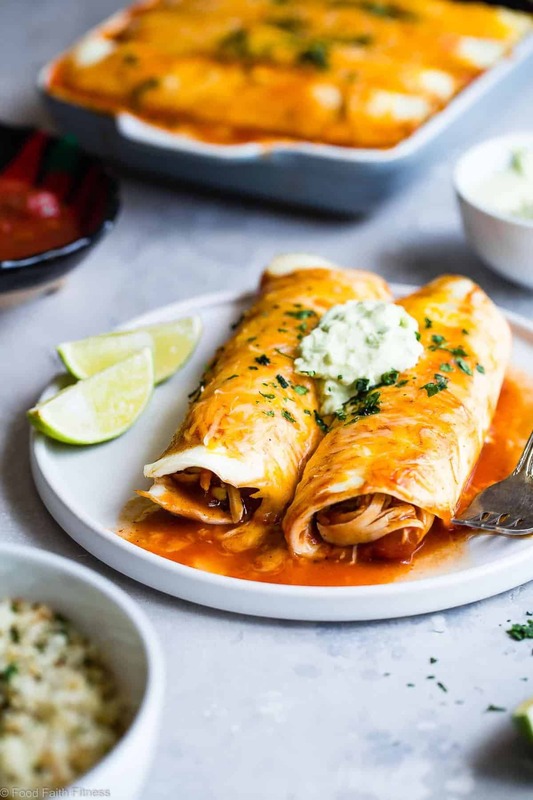 A SUPER high protein, Healthy Low Carb Chicken Enchilada Recipe is coming to a breakfast near you and they do NOT taste rubbery and weird like you would expect egg whites to taste. Even Mr. FFF (who can’t eat dairy) ate like 6 healthy enchiladas because they were SO GOOD he didn’t even care about the cheese situation at hand. I’ve been making everything with this tortilla recipe lately. From a boring ham sandwich to some DELISH healthy BBQ chicken quesadillas , these are going to be your new best, muscle-BUILDING friend. Maybe for dinner after you go-out-for-breakfast-and-order-what-you-actually-want? Then you can have a whole day of EPIC FOOD. <– Breakfast for dinner. It’s ALWAYS a winner. Good ideas. This post is full of them. I also shared the healthy chicken enchiladas recipe on Food Fanatic, so be sure to check it out there! Taylor, great idea! I love chicken enchiladas a little too much so I’m always looking for new ways to enjoy them. Sorry to hear about your wasted healthy breakfast choice. I hate when that happens! I’m so resistant to go anywhere new! I am so glad that I am not the only one that fears change! But thanks for the love Bri! Happy Wednesday! You MUST try those pancakes girl. I almost went last night for dinner…alone. Because I had a craving and the hubs was at work! Enchiladas are my favorite. I always order them when they are on the menu. This version is so much better! Love that you’ve made it healthy! Thank you so much Kim! You’ll love these! 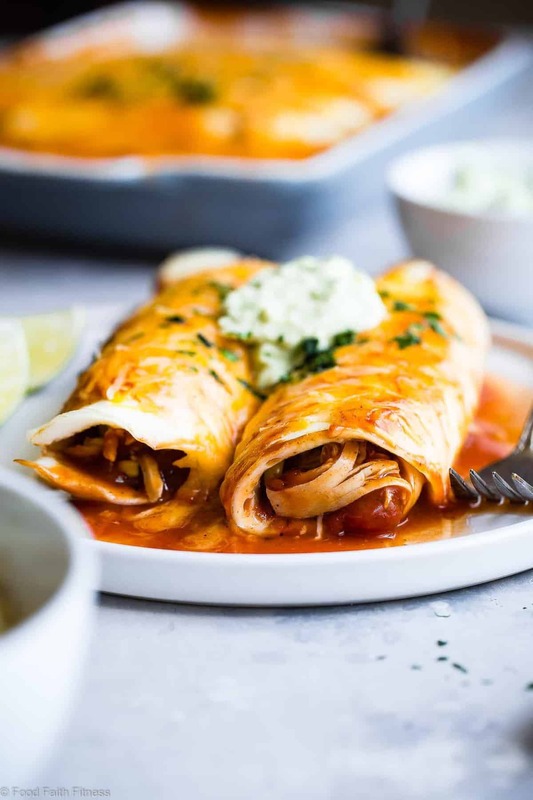 I am all down for protein packed egg white enchiladas stuffed with chicken – throw in some beans for added protein oompf and I will be one happy gal! Oh beans! Good call! Thank you lovely lady, I hope you have a FAB wednesday! OH MY GAAAAAAAAAAAAAA! Egg white tortillas?!!! You genius. I rarely make enchiladas these days, because: gluten…but an egg white tortilla is fan-freaking-tastic. You make me a happy woman, Taylor…you do indeed! Yup, having a wah waaaah going-out-to-dinner experience is lame. It makes you wish you stayed in and baked all the healthy chicken enchiladas. Better luck next time, my dear! Haha thank you lovely lady..these are totally for you if you’re an enchilada aficionado! Ahhh I hate when that happens!! 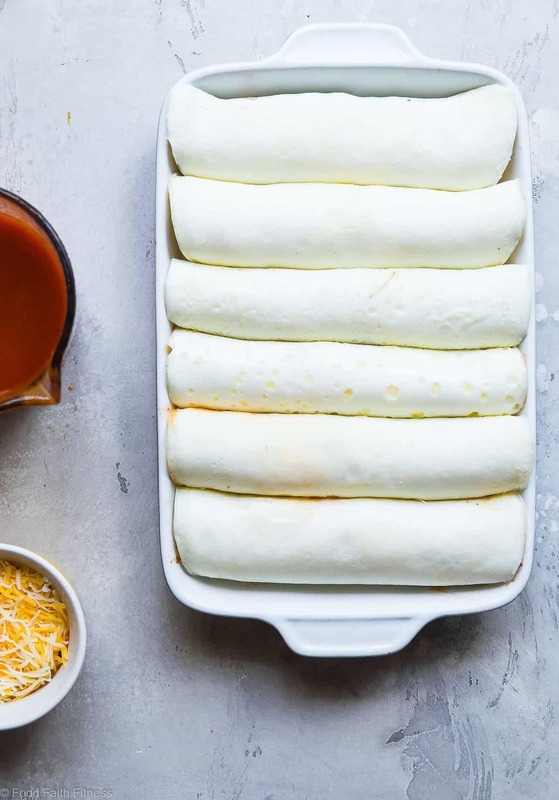 These enchiladas look like they totally made up for it though…LOVE the idea of the egg white tortillas! Thank you lovely! I am glad you understand! It would be perfect for girls night! Too bad about the hubs 🙁 Thanks for the love and pinning!!! Now why on earth are you sorry for lack of photos when it only takes that ONE to make me drool on my keyboard? AWESOME recipe, Beautiful! Taylor, I just love the way you roll! These look ridiculously good (and a pretty solid reason to take a night off of those tasty IHOP blueberry pancakes). Right?! These are the one breakfast item that I can part ways with IHOP over! Thank you so much Amy! These are brilliant!! I used to eat egg white omelettes all the time in college, but never thought about their potential as a tortilla substitute – and egg whites probably have a leg up on the tortillas anyway, since they can’t really get soggy like tortillas. Again, brilllllliant! Exactly! No soggy tortillas in these here enchiladas! Glad you like the idea, thank you so much CakePants! You are just full of fabulous ideas today! Egg white tortillas? Enchiladas for breakfast? Brilliant! Enchiladas are one of my absolute favorites. And aren’t they just about one of the hardest things to photograph? 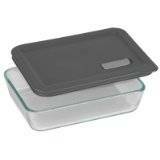 I think casserole-type dishes in general are a challenge! YES! SO HARD TO PHOTOGRAPH. Funny you said that, I just finished a casserole photoshoot and it was so UGH. Glad I am not alone! And, thanks for the enchilada love Kristine! Haha.. I totally go to IHOP all the time, but have never tried those pancakes!! I guess it’s because I usually go for dinner. But maybe instead of going there, I should make this enchilada. This looks SO good! I think making these would be a grand idea! Thank you so much! These have to be one of the best “Tortilla” recipes I have ever come across! They look incredibly good… Such a great dinner idea! Can’t wait to try! Thank you so much Samina, you are so sweet! If you do try them, please let me know how you like them! Egg white tortillas? My mind is blown! What an awesome breakfast recipe! Side note: I had that same experience WITH cook dough cheesecake at The Cheesecake Factory. SO DEPRESSING! HAHA @ punch someone in the face…LOVE IT! Sooooooooo soooo in love with these!! 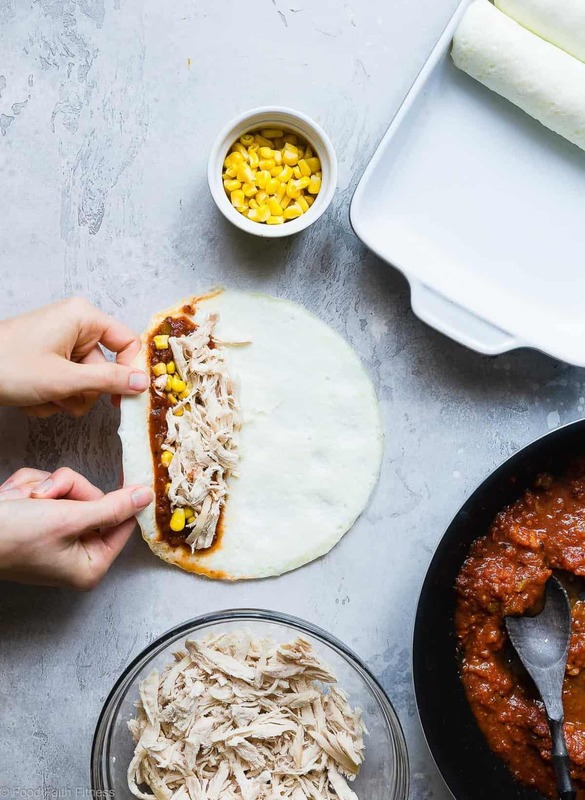 Enchiladas are my absolute weakness, and I’ve tinkered around with healthy enchiladas, but they still included tortillas. THESE are making me giddy! I absolutely love that you used egg whites as the tortilla! So smart! I actually thought of you when I posted these, I know you <3 your enchiladas!! Unfortunately, I don’t believe in counting calories as I have previously struggled with anorexia, and counting leads me down a bad road. For this reason, I have chosen to not include them on my recipes – sorry! 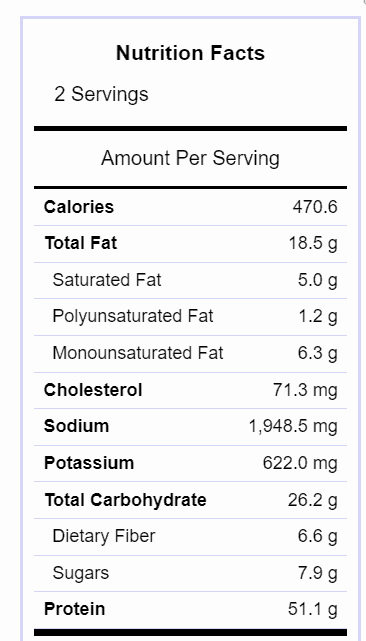 However, you can easily plug the recipe into https://www.myfitnesspal.com/ and it will give you the info you need. I hope that helps! I totally love this idea!!! I will definitely be making these! I love this idea. It’s such a healthy alternative to tortillas. Now I don’t have to feel guilty about eating Mexican! Exactly..you can eat it in your skinny jeans! Woo hoo! Thanks Mallory! OMGoodness! I am dying over this!! I cannot wait to try them! Haha, I WISH my hubby ate more protein!! Thanks Lauren! What a great way to use egg whites! Love this healthy version of chicken enchiladas! I LOVE this idea! And love your suggestion of having an epic food day! 😉 I’ve made these egg tortillas before, but never really thought of using them for enchiladas! What a great idea! It looks amazzzzzing! I think I need some food…enchilada anyone? Thank you Karen, you would totally love these! I am thinking yes to enchiladas! I have been eyes that baby, but I can’t not order my pancakes! You MUST try the pancakes Jamie! You’re so welcome, thanks for hosting! Love enchiladas and always looking for healthier ways to prepare my favorite foods. Really appreciate this recipe and have pinned to my Food and Drinks to make board. Hi Taylor! I just found your blog and I love it. 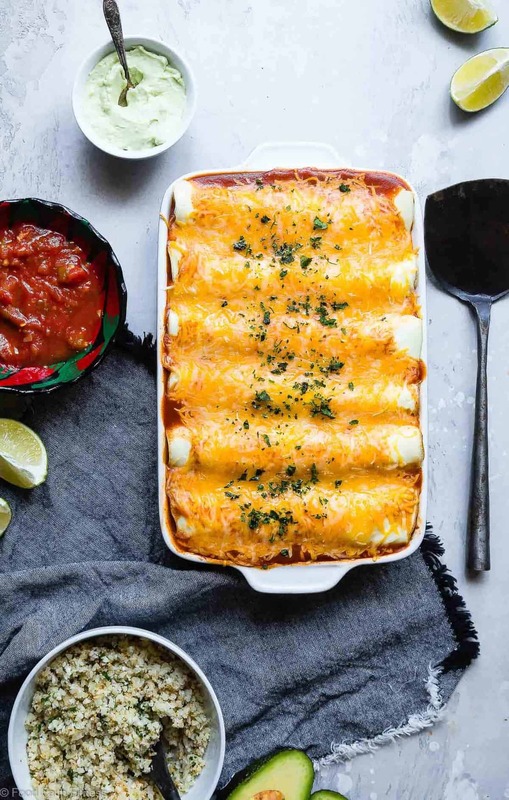 I’m going to try to make these enchiladas this weekend. 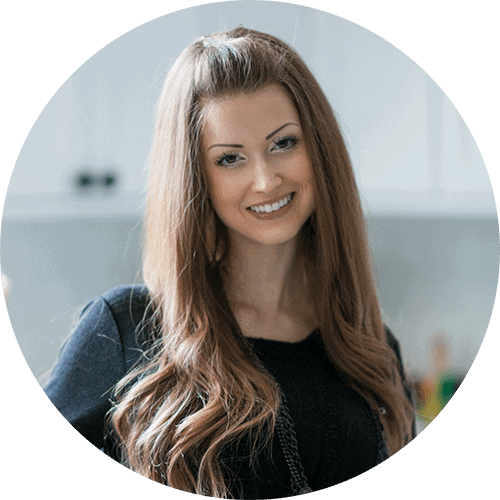 Do you have the nutritional information by chance? Unfortunately, I don’t. As my “about me” says, I am a recovered Anorexic, who still struggles with food, so it’s a real trigger for me to count calories. I try to focus on just eating intuitively and eating healthy, whole foods. I know that isn’t what you want to hear, but I have to look out for my mental health 🙂 I am SO sorry! However, there are tons of great tools online like My fitness pal! Made these last night for myself and a friend. They were great! As a lady with Mexican origins who LOVES enchiladas I can say they aren’t exactly the same, but definitely help the craving. So much healthier and I have plans to try other combinations. Thanks so much! I do want to leave my honest thoughts, but I also want to say thank you for the wonderful idea of breakfast enchiladas. YUM! 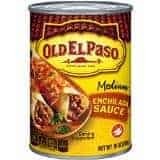 First, I would like to remind you and your readers that canned goods, such as enchilada sauce are not always/usually not in my experience gluten free. So, please use caution when you are stating in your title for the recipe that this is a gluten free item. Secondly, IHOP is not good for you. Let’s be real. It tastes great, because it is loaded with butter, syrup and many other items, such as GMO flour, factory eggs, etc.. I wish you well on your adventure to find healthy recipes. Thanks for the love and pin Cahterine! I hope you love! You know, I’ve never tried it! BUT, I THINK you could? I just don’t want to promise haha! Let me know if you try it! And you’re so welcome!!! Woo hoo! I hope that you love them! Wow! Does your IHOP have something different than mine? The harvest grain and nut pancakes have gluten in them according to the allergy ingredient menu on the IHOP website. Is this something new? This is a VERY old post that the photos were just updated – probably 3 years old 🙂 Also, I personally don’t eat GF all the time!